Q: Why did you start Wollongong Women’s Cycling Club as a subgroup of an existing Club? Who are the women behind it? Jules Verheyen founded the club in late 2015 after running She Rides cycle coaching programs and wanting somewhere for her graduates to go to continue cycling after the programs ended. She started the cycling club with weekly Wednesday rides and monthly weekend bunch rides. The club serves as a networking group so women can meet others to cycle with for fun and fitness. It’s relaxed, and fun and seen as a really accessible entry point for women new to cycling. Q: Is your emphasis on racing or do you also focus on just riding for fun, fitness, etc? The club is registered with Cycling NSW as a recreational club and that is part of the appeal for women who cycle for fitness and friendship rather than for competition. However, as members have gained in confidence they have given racing a go, grew to love it and moved over to our umbrella club, the Illawarra Cycle Club which is a racing club. Q: I believe you also offer coaching, can you tell us a bit about how that works? The club culture is really focused on women being confident to ride on the road and a big part of that is giving them the skills to ride safely both individually and in a bunch. Many of our riders come to the club through She Rides so already have an interest in building their skills and improving their cycling. We run bunch etiquette courses periodically as well as Try the Track coaching days. Jules is a Level 1 coach and recently trained our WWCC team that entered the Nowra Team Time Trials riding for the ICC. Q: How many women do you get a typical women’s bunch ride? What advice would you give to other groups wanting to start a women’s only ride? We generally have 6-8 women attend regularly and we get more than a dozen riders to our special event rides. The advice is to make sure rides are inclusive and and new women feel welcome. We make an effort to liaise with our She Rides graduates and make sure they feel welcome along to club rides after their programs are finished. Listening to what women want in terms of ride distances, routes and start times is important. Also realising that women lead busy lives and have competing priorities, and are not always able to find time to be consistent with their cycling is important. So our club makes sure that different abilities and fitness levels are catered for so members can drop in and out of participating as time permits. As our riders grow in skills and confidence, they will form their own cycling networks and establish their own cycling routines which is great because the club has helped them establish themselves as confident, independent and capable riders. Q: What about bike maintenance, do you think it’s important for women? We are sponsored by a local bike shop, Simple Cycles who kindly host bike maintenance courses for our members. Q: As well as what you gals are doing in the Illawarra, how can we encourage more women to ride bikes of all types? The women who ride are the greatest ambassadors of the sport and the Illawarra is lucky in that it has a few wonderful, passionate women who go out of their way to nurture new cyclists. Jules is generous with her time and takes new cyclists under her wing and supports them enormously when they are starting out riding, or just getting started in racing. Catt Hooten is an incredible support to women in track cycling in Wollongong and is remarkably helpful with her advice and support. This welcoming, supportive attitude filters down so other women cyclists who have benefited from their mentoring are then keen to take their turn to help other women feel welcome and know that cycling is not some elitist, inaccessible sport, but rather something everyone can join in with at a level that suits them. Our club has the whole range – from women training for time trials and gran fondos and overseas cycling trips, to women going on a relaxed bike path wander for a social coffee catch up and plenty of stops for photos. 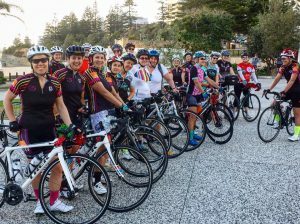 The Wollongong Women’s Cycle Club has helped so many women get on their bikes and feel safer out on the road and more confident cycling on routes they would never have attempted on their own. Tell us about other groups of women like Wollongong Women’s Cycling Club via comments or the Women Who Cycle Facebook page.